Designer Teresa Lagrange created some adorable maps for the introduction of the book. 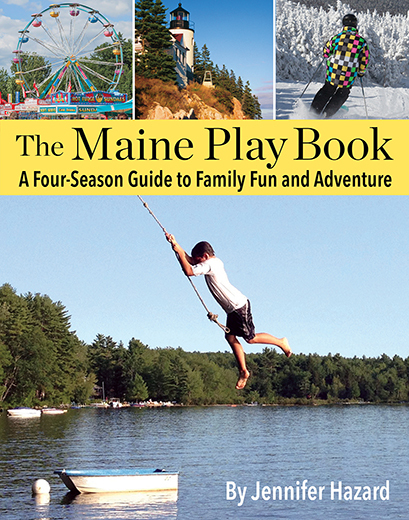 While visitors love to explore Maine in the summer months, the book covers all of the seasons. MP hopes you’ll find an adventure that inspires you in any kind of weather. Throughout the book, there are notes for side trips and places to find good things to eat. MP loves that this guidebook has bold color photos. What better way to get a sense of a place than to see it in color. The back of the book offers a full monthly calendar of events, a handy list of what’s in season at local farms, favorite swimming spots throughout the state, and all of the places we like to explore outdoors. This section connects many of the places highlighted in the book and makes it easy for families to create a full day of adventures, no matter what the season. We hope you enjoy our tried-and-true suggestions for family hikes, farm visits and cool community events! If you’re interested in learning more about the book, stop by your local bookseller or visit here.